(Release Date: October 7, 2014)  The original films from Asylum Entertainment and the Syfy Channel are in no danger of being confused for high art, but their formularecognizable B-movie celebrities/musicians/former television stars + a villain of the animal or monster variety + a weather event + low-rent but workmanlike effectsconsistently draws in flocks of schlock enthusiasts. When "Sharknado" premiered in 2013, it became a social-media sensation and pop-cultural phenomenon, its vision of killer sharks taking flight in tornadoes and coming ashore to terrorize unsuspecting humans so off-the-wall bonkers that it was kind of charming. Truth be told, the insane concept was better than the actual finished product, which too often fell into so-bad-it's-just-bad territory. High ratings helped to immediately greenlight a sequel, and the fear was that a follow-up would be too self-aware of its own campiness to work. Fortunately, the opposite turned out to be true. Bombarded with cheeky cameo appearances and a main cast once again headed by Tara Reid and former "90210" star Ian Ziering, "Sharknado 2: The Second One" is everything that "Sharknado" should have been. Director Anthony C. Ferrante, screenwriter Thunder Levin and the pic's ensemble of actors all treat the proceedings with the seriousness one might expect from a hard-hitting action-drama. From these straight faces, however, comes comic gold that fittingly even includes "Airplane!" star Robert Hays in an early scene as a pilot. The film, which finds rekindled lovers Fin Shepard (Ian Ziering) and April Wexler (Tara Reid) heading to the Big Apple to promote April's published guide to surviving a sharknado and once again getting mixed up in a city-wide shark invasion, makes no qualms about being anything other than what it is. Everyone involved is clearly having a ball, and their buoyant mood carries over to the audience. Now let's be very clear here. "Sharknado 2: The Second One" is as ridiculous as cinema gets, but from this silliness comes a sly, everything-but-the-kitchen-sink approach that proves infectious. From April autographing her book in preschool handwriting in the middle of a page of text, to a hilarious airplane crash landing that includes a priceless appendage dismemberment, to location shooting in NYC that adds unexpected production value to its lunacy, to an "Evil Dead 2"-inspired climax that finds Tara Reid sporting an electric buzz saw where her hand used to be, every second of "Sharknado 2: The Second One" is crazier than the last. It's a stupid, stupid movie, but also, in its own way, rather smart. Director Anthony C. Ferrante knows exactly what he is doing, and the results are as exceedingly amusing as they are entirely inconsequential. "Sharknado 2: The Second One" arrives on Blu-ray with a 1080p transfer that is dazzlingmost of the time. By and large, the image is impeccably detailed, a true-blue high-definition presentation that comes close to looking as good as a big-budget feature. The computer effects and greenscreen shots are the central give-away that things are not as perfect as they may appear from afar, with intermittent soft moments and even shots that are downright blurry. Did the cameraman forget to focus? Who knows? These instances do not happen too often, but they are there, and are the one negative about an otherwise glorious high-def showcase. The 5.1 DTS-HD Master Audio is very good, sometimes great, full of dynamic range and effective sonic surrounds. There is little downtime in a movie that is wall-to-wall action, and this nearly non-stop activity benefits from this lossless track. 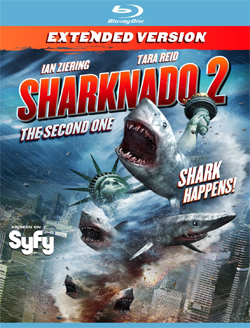 Asylum Home Entertainment's Blu-ray release of "Sharknado 2: The Second One" is an impressive package loaded with informative bonus content, behind-the-scenes footage and twoyes, twocommentary tracks. The film will be winning no prestigious awards, but as a Friday or Saturday-night viewing option for audiences looking to kick back, unwind and have a laugh, it deserves a lot of credit for upping the ante and surpassing expectations. A prime party flick, the "Sharknado 2: The Second One" Blu-ray earns an affectionate recommendation.